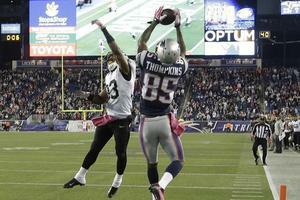 About half of the Gillette Stadium crowd had made its way for the exits when Tom Brady’s pass intended for Julian Edelman was intercepted by Keenan Lewis with 2:24 to play and the Patriots trailing the unbeaten Saints by four on Sunday afternoon. A larger population of people in the evening undoubtedly changed the channel by the eighth inning of Game 2 of the American League Championship Series with the Red Sox down a game in the series and positively lifeless at the plate during a 5-1 deficit to the Tigers. Anything can happen, especially for the squads who just don’t know how to quit. What could have been a terribly disappointing Sunday in Boston sports instead produced one of the most amazing days in the history of a city that’s enjoyed more than its fair share of winning over the last dozen years. Prior to 2001, fans of the Patriots or Red Sox would have had every reason to turn their backs prematurely in moments of despair. We represented “the fellowship of the miserable,” or so said brief and disastrous Celtics coach Rick Pitino. But, to a certain degree, he was right. Whenever our beloved teams got close to greatness, the mountainous climb managed to end in a devastating fall. A passionate fan base absent winning can produce an awful lot of ire, especially when supporters of other teams take pleasure in that anguish. No longer, not by a long shot. Thousands of fans stood by nervously in person while millions of others did so across the country as Brady – the man who appeared lost on the sidelines, looking for answers after his pick – rallied his severely depleted Patriots to the 38th game-winning drive of his career, capped by a 17-yard touchdown strike to undrafted rookie Kenbrell Thompkins with a mere five seconds left on the clock. Final score, 30-27, Pats. New England improved to an improbable 5-1 after a game that felt much bigger than a normal regular season affair, while dropping New Orleans to that same record. Just a few hours later the Red Sox, almost poetically down by that identical margin, had chased Detroit starter and Cy Young favorite Max Scherzer from their game, even though he’d held the Sox’ bats to two measly hits and totaled 13 strikeouts. Manager Jim Leyland’s decision to pull the ace is a second-guess he’ll undoubtedly lament the whole way to Motown. Instead, Leyland turned to the bullpen and three pitchers combined to load the bases for David Ortiz before a fourth, Joaquin Benoit (the same man guilty of relinquishing his team’s no-hitter the night before), gave up a deafening grand slam to the new Mr. October to tie the game. 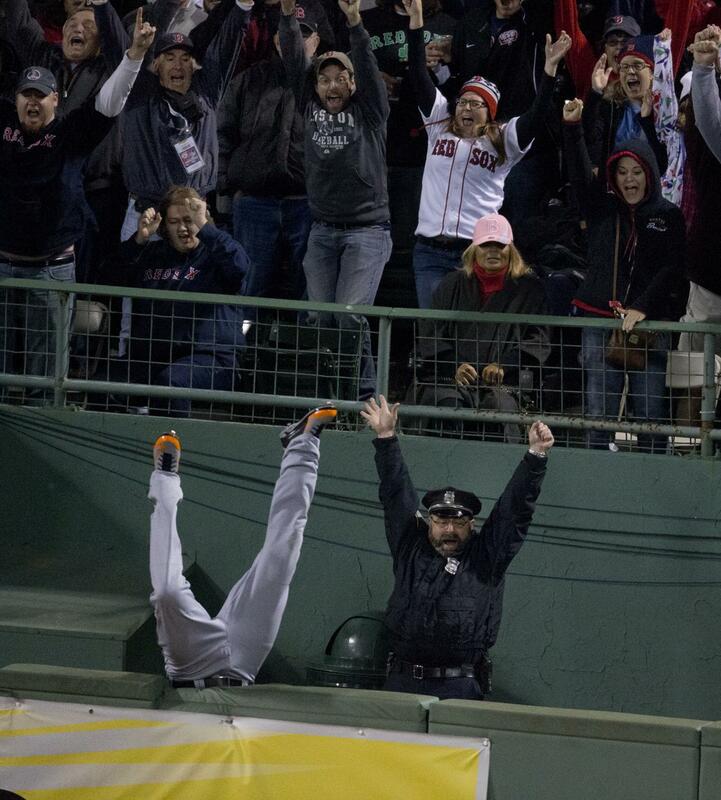 An inning later, a constellation of stars must have formed a ‘W’ in the sky much the way Torii Hunter’s falling legs and bullpen officer Steve Horgan’s jubilant arms did as the Ortiz blast traveled over the wall. Boston’s 2013 version of Kevin Millar, Jonny Gomes, singled on a ball to short that was thrown away by Jose Iglesias, the very defensive wizard traded away by the Sox at the July 31 deadline. 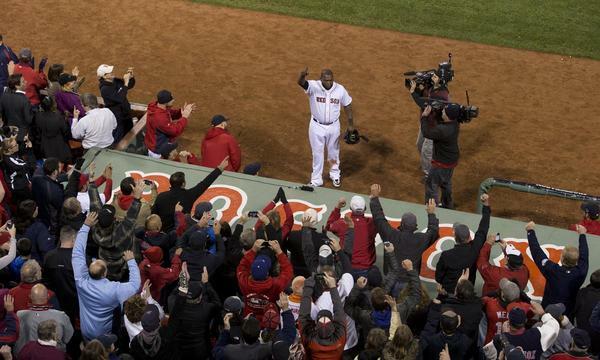 After Gomes advanced to second, Jarrod Saltalamacchia was given new life when Prince Fielder failed to catch a pop fly in foul territory, and he rewarded the Fenway faithful with a sharp single to left to give the Red Sox the 6-5 walk-off win. Series tied at one heading to Detroit for Game 3 on Tuesday afternoon. It all only made sense in a way. Two icons destined to finish their legendary careers in New England, Brady and Ortiz are linked for so many reasons already that, for them, Sunday was just another page in the scrapbook. Now in their mid-to-late-30’s, they’re both early-underdogs who could have wound up anywhere, Brady as a sixth-round draft pick and Ortiz as a free agent released after parts of six pedestrian seasons in Minnesota. As luck would have it, they landed here, a future Hall of Fame quarterback with three Super Bowl championships, five trips to the big game, countless awards, and unshakable fourth quarter poise; and a designated hitter with two titles, nine All-Star nods, 15 postseason homers, and a 2004 playoff run that shall live on forever in sports lore. The gifts these men started giving Boston in the early 2000’s are no less sweet or rewarding a decade or so later, but rather a reminder of how great we have it with each fresh dramatic moment. Still, if Hollywood had scripted the day, even the most optimistic fan in the Hub would have said, “Come on, now.” It just goes to show some of the best stories can’t possibly be written. In this moment, the Red Sox are three wins shy of a return to the World Series in their new best-of-five, and the bound-to-get-healthy-eventually Patriots have lost only once. What happens next is a mystery but, good or bad, we’ll always have Sunday. Oh, and if you tuned out the last chance or two, consider sticking around this time. You might witness something you’ve never seen before. Adam Kaufman is a writer and broadcaster who can also be heard regularly on 98.5 The Sports Hub, WBZ NewsRadio 1030, the national CBS Sports Radio Network, and broadcasting Boston College hockey games. The Massachusetts native is a Syracuse grad and a pop culture fanatic who offers a unique and entertaining look at your favorite Boston sports teams. Please don't hold his love for Jean-Claude Van Damme movies against him. Send Adam Kaufman an email. What is Avery Bradley’s future with the Celtics?